This weekend was a fly fishing marathon of sorts. My son and I covered three different streams in three days, shopped for fishing gear and talked fishing with numerous people about fly fishing, researched fishing opportunities around the region, and caught some nice fish while escaping the oppressive heat that seems to have taken the nation hostage this summer. 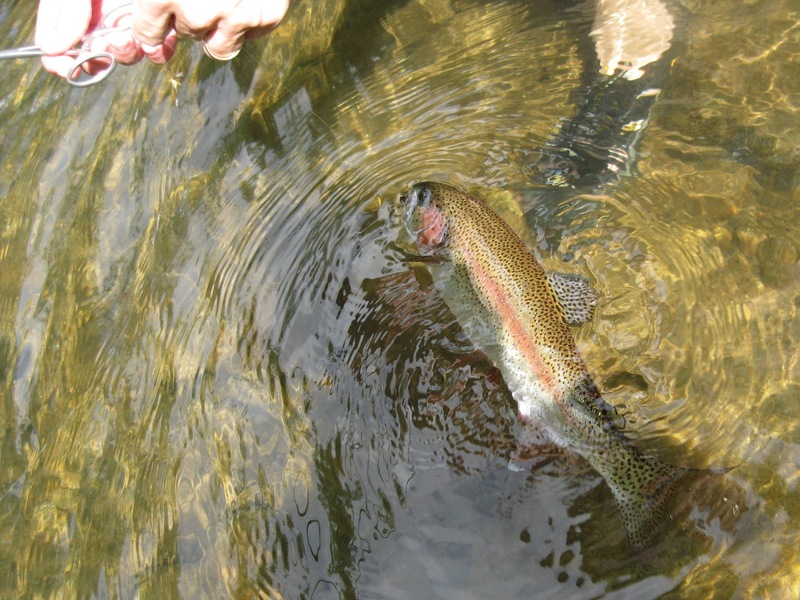 On Sunday afternoon, I caught my first large rainbow trout since purchasing a new fly rod. As you can see from the photo above, this fish was about as long as my forearm from elbow to the middle of my hand. We estimated him about 15 inches and about 2 pounds. I caught him with a nymph in about 1 1/2 feet of water near a cut bank. My rod was a 5 wt, and I was using 6X tippet. He jumped once and ran twice, the second time pulling line out from the reel. 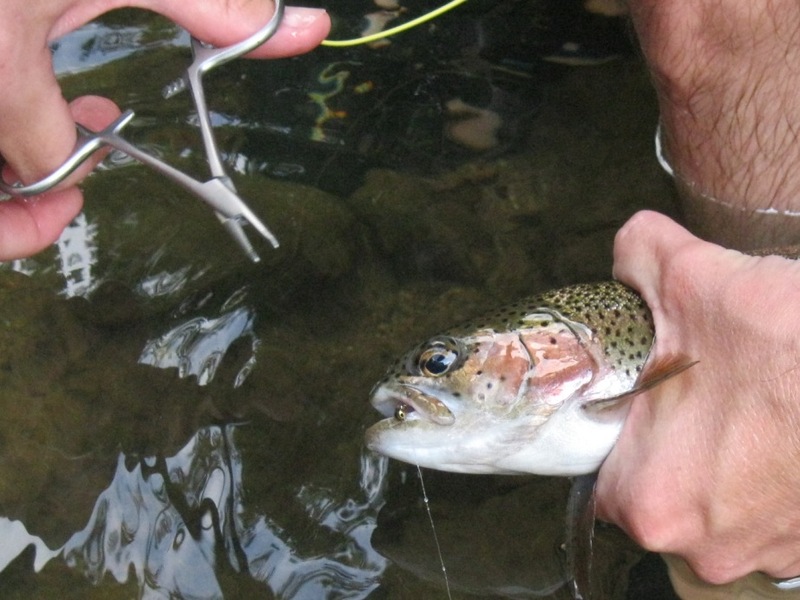 We enjoyed that sweet whine of the drag as the trout pulled the line as he straight-lined it up river. We had about a five minute fight to get him close enough to bring him in, and we promptly released him. This is a great time of the year to get up into the mountains for recreation since it has been so hot lately. We enjoyed temperatures in the low to mid 70s most of the time we have been fishing this weekend. That said, the water is extremely low, so the fish may not be as responsive as at other times of the year. 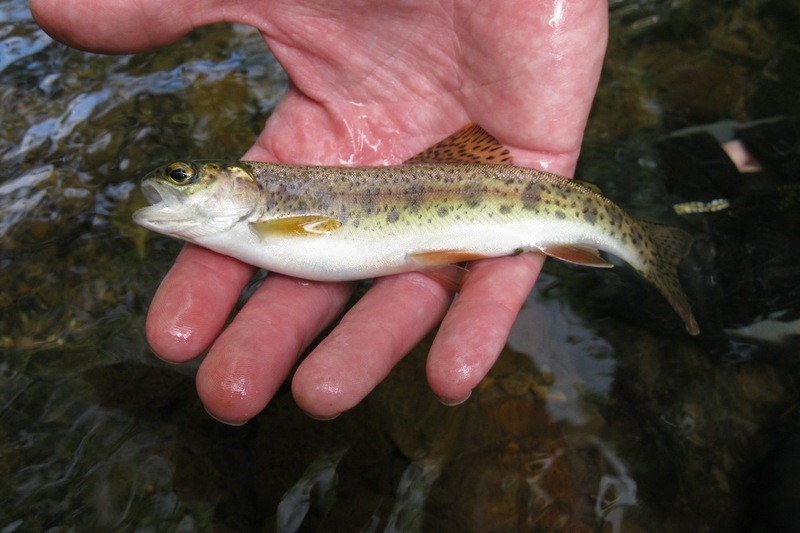 The heat puts a lot of additional stress on trout, who require the colder water to survive. We therefore have minimized the length of fights or playing the fish out too long, as in the heat it is difficult for them to recover. 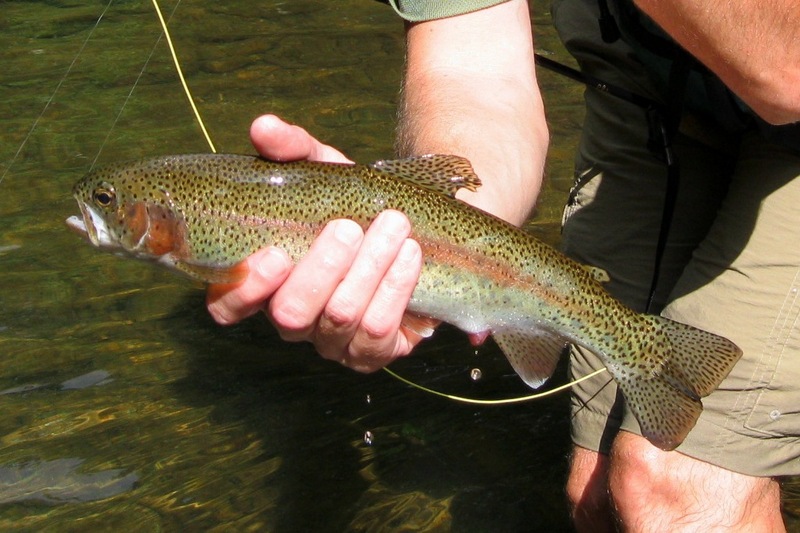 The Southern Appalachians boast some of the best fly fishing in the Eastern United States. That declaration, while seeming strange on its face—fishing for trout, a cold water fish, in The South?—actually makes a lot of sense when you think about it. Streams and rivers originating from springs and filtered runoff from mountains, relatively remote pockets of forestland, and steep valleys providing lots of cover and protection from the heat of the sun combine to make the streams of this region good for trout. 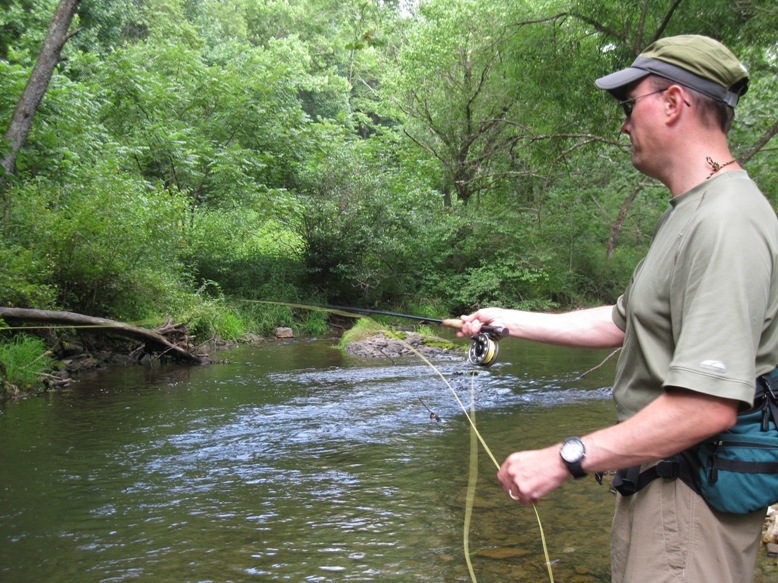 Within a 60-mile radius from Abingdon there are numerous “blue ribbon” trout streams in Virginia, North Carolina, and Tennessee that provide first class fly fishing opportunities. Many are tight creeks and smaller streams, but there is definitely some wonderful fly fishing in this area. The Virginia Department of Game and Inland Fisheries is a good place to start to get some basic information on regulations and fishing locations in Southwest Virginia. 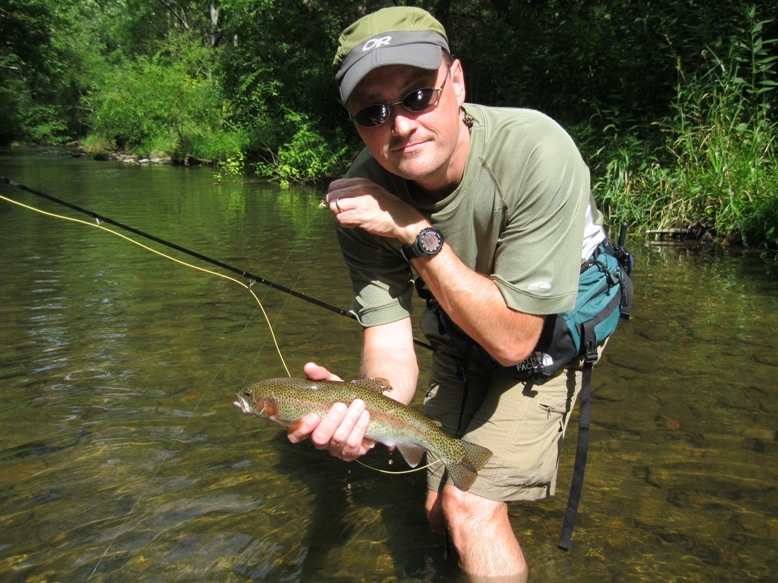 Abingdon is fortunate to have an excellent and well-equipped fly fishing shop, Virginia Creeper Fly Shop, whose owner Bruce Wankel is always welcoming, provides useful information, and also guides local waters. Mountain Sports, Ltd. in Bristol also sells fly fishing specific gear and has knowledgable staff about fly fishing in the region. Here is a map of the major trout streams in far Southwest Virginia(including the Abingdon area) and a map of the major trout streams in the area to the north and east in Southwest Virginia (including Wythe and Grayson counties). All photos in this article taken by Karl Thiessen.